One of Aaron’s tasks this morning was to start clearing the falling leaves. He used his handy blower to stir the frisky foliage. Jackie and I left Elizabeth behind when we left before our friend had finished this morning to meet Frances, Fiona, Paul, James, Danni, and Andy for lunch at the Luzborough House pub in Romsey. Elizabeth had a cold and was careful not to pass it on, either to my two pregnant nieces or to our mother. The venue had been chosen so that sister-in-law Frances, her daughter, son-in-law, and grandson could visit Mum in hospital. The meals were OK. My choice was steak, prawns, calamari, and salad followed by ice cream sundae. I drank Old Speckled Hen. On our return home, Jackie and I, having opted not to overcrowd Mum, took a diversion into the forest. At Bramshaw, we took a lane we have not previously discovered. This led us to Bramble Hill where, sharing the sky with cotton wool clouds, the sun gilded the bright bracken. I was delighted when an obliging young lady brought her steed into shot. As I told her, she had just made a picture. A string of stately alpacas stepping across the fields of ‘Faraway Alpacas’ in Godshill, passed a blissfully happy hembra suckling her contented cria. Further along the road a lone chestnut pony took its turn at making its own couple of Autumnal pictures. No further sustenance was needed this evening. This entry was posted in Uncategorized and tagged alpacas, autumn leaves, bracken, Bramble Hill, cria, hembra, horse and rider, pony by derrickjknight. Bookmark the permalink. Lovely autumnal photos and prose Derrick! I love how the golden bracken seems to glow with imbibed sunlight! I love autumn’s soft, angled light, like a Dutch Masters painting. Lovely photos, Derrick! Thanks very much, Lavinia. At 96, Mum couldn’t shift a chest infection and was admitted to hospital soon after her birthday. Antibiotics have worked, but she is still much weakened. She is now in rehab. I am glad she is doing better now. I hope she will be home again soon! Ah, some new animals for the album, alpacas!! But don’t think I missed my chestnut! What a beautiful diversion, Derrick! It does seem strange to see alpacas wandering around there! In common with people of manifestly non-British hue. Lovely how that obliging young lady and her steed made that photo. Really great timing! Beautiful autumnal photos! Bramble Hill is just lovely as are the alpacas. 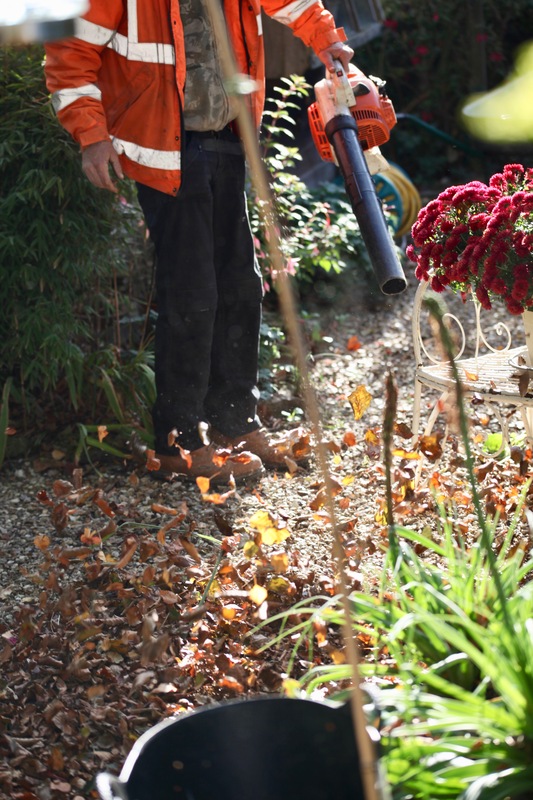 A gravel pathway ALWAYS requires a blower – they are invaluable. And Alpacas are now very common in Australian farms. One or two in a paddock with sheep acting as guards against foxes – a South American import to beat a European feral pest. You are the Wordsworth of the blogging world. That would hardly be the case, Derrick. Thanks for your kind words. Gorgeous photos, Derrick; you’ve captured the beauty of the season. That’s a beautiful picture of the horse rider, Derrick! How wonderful to see the alpacas! The cotton wool clouds in the blue sky are stunning! And the lone rider in that photo is perfection! Some beautiful autumn scenes and you captured them in your photos, Derrick! Lovely, glowing forest shots–plus horses and the alpacas. I hope your mom is continuing to improve. Wonderful views Derrick.. and my hubby is partial to a drop of Old Speckled Hen too… He enjoys the speciality beers.. ❤ Have a great week.. White over with frost here this morning Derrick.. Especially love the last two horse pics! Ah, the golden light mixed with green and memories of riding horseback. Your pictures are savory. Golden pictures! Hope Elizabeth soon feels well and does’t pass that cold on to you and Jackie. Nice to see the alpacas. Are they on a farm? Thanks for your reply, Derrick. I have to say that those blowers are my pet hate. Thanks a lot, Mary. The noise?